A structure and its precalculated pocket measurements can be retrieved by PDB ID (4-character Protein Data Bank Identifier) from the Computed Atlas of Surface Topography of proteins (CASTp) database using Fetch by ID or the command open (with prefix castp:). The CASTp database does not contain all PDB entries, and structures from the database may be older versions of the current PDB entries. Results for a structure not in the database can be shown in Chimera by requesting a calculation at the CASTp server and opting for results to be returned by e-mail. After the results have been received and unzipped, opening the file named *.poc in Chimera automatically also reads files with the same name/location except the suffixes .pdb, .pocInfo, .mouth, and .mouthInfo. CASTp: Computed Atlas of Surface Topography of proteins. Binkowski TA, Naghibzadeh S, Liang J. Nucleic Acids Res. 2003 Jul 1;31(13):3352-5. CASTp: computed atlas of surface topography of proteins with structural and topographical mapping of functionally annotated residues. Dundas J, Ouyang Z, Tseng J, Binkowski A, Turpaz Y, Liang J. Nucleic Acids Res. 2006 Jul 1;34(Web Server issue):W116-8. Retrieving/opening CASTp results in Chimera shows the structure in the main graphics window and associated data in a dialog, or Pocket List. CASTp information is included in saved sessions. Surface (optionally colored by hydrophobicity) - show molecular surface contributed by the atoms. The surface can be colored by amino acid hydrophobicity (values in the Kyte-Doolittle scale shown with colors ranging from dodger blue for the most hydrophilic to white at 0.0 to to orange red for the most hydrophobic), or left unchanged from its existing colors, which match the underlying atoms unless the surface has been colored separately. The first time surface is shown for a given structure, there may be a lag of several seconds as the surface is calculated. Only the contiguous surface patch with the largest surface area is shown. 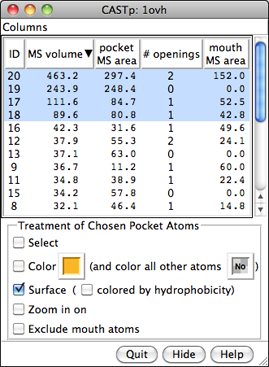 If desired, all patches associated with the pocket atoms can be shown, by selecting the atoms (using the Select option above), then using the command surface sel or Actions... Surface... show in the main Chimera menu. 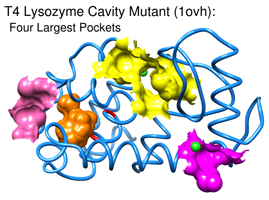 However, the automatically hidden patches rarely belong to the pocket of interest, instead arising when the pocket atoms also contribute to other parts of the protein surface such as neighboring pockets.